This is an old revision of this page, as edited by Bender the Bot (talk | contribs) at 08:50, 17 October 2016 (→‎Historical context: http→https for Google Books and Google News using AWB). The present address (URL) is a permanent link to this revision, which may differ significantly from the current revision. 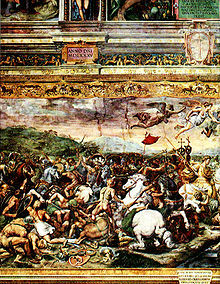 Battle of the Milvian Bridge, Raphael, Vatican Rooms. The artist depicted the troops of Constantine bearing the labarum. Constantinian shift is a term used by nontrinitarian Christians, as well as Anabaptist and Post-Christendom theologians, to describe the political and theological aspects of the 4th-century process of Constantine's integration of the imperial government with the church. The term was popularized by the Mennonite theologian John H. Yoder. The claim that there ever was Constantinian shift has been disputed; Peter Leithart argues that there was a "brief, ambiguous 'Constantinian moment' in the fourth century," but that there was "no permanent, epochal 'Constantinian shift'." Icon depicting the Emperor Constantine (centre) and the bishops of the First Council of Nicaea (325) holding the Niceno–Constantinopolitan Creed of 381. According to Eastern Orthodox and Roman Catholic tradition, Constantine I (reigned 306–37) adopted Christianity as his system of belief after the Battle of Milvian Bridge in 312. His victorious legions fought under the "labarum", a standard with the first two Greek letters of Christ's name (XP). In 313 the Edict of Milan legalised Christianity alongside other religions allowed in the Roman Empire. In 325 the First Council of Nicaea signalled consolidation of Christianity under an orthodoxy endorsed by Constantine, and though this did not make other Christian groups outside the adopted definition illegal, the dissenting Arian bishops were initially exiled. But Constantine reinstated Arius just before the heresiarch died in 336 and exiled the Orthodox Athanasius of Alexandria from 335 to 337. In 380 Emperor Theodosius I made Christianity the Roman Empire's official religion (see State church of the Roman Empire, Byzantine Empire and the Goths) and did enforce the edict. In 392 Theodosius passed legislation prohibiting all pagan cultic worship. During the 4th century, however, there was no real unity between church and state: in the course of the Arian controversy, Arian or semi-Arian emperors exiled leading Trinitarian bishops, such as Athanasius (335, 339, 356, 362, 365) Hilary of Poitiers (356), and Gregory of Nyssa (374); just as leading Arian and Anomoean theologians such as Aëtius (fl. 350) also suffered exile. Towards the end of the century, Bishop Ambrose of Milan made the powerful Emperor Theodosius I (reigned 379–95) do penance for several months after the massacre of Thessalonica (390) before admitting him again to the Eucharist. On the other hand, only a few years later, Chrysostom, who as bishop of Constantinople criticized the excesses of the royal court, was eventually banished (403) and died (407) while traveling to his place of exile. Critics point to this shift as the beginning of the phenomenon known as Caesaropapism. In its extreme form, such critics say, Christianity became a religious justification for the exercise of power and a tool in the expansion and maintenance of empire, a Christian empire, also known as Christendom. Augustine of Hippo, who originally had rejected violence in religious matters, later justified it theologically against those he considered heretics, such as the Donatists, who themselves violently harassed their opponents. Before him, Athanasius believed that violence was justified in weeding out heresies that could damn all future Christians. This continued a line of thought started by Athanasius who felt that any means was justified in repressing the Arian belief. In 385, Priscillian, a bishop in Spain, was the first Christian to be executed for heresy, though the most prominent church leaders rejected this verdict. Theologians critical of the Constantinian shift also see it as the point at which membership in the Christian church became associated with citizenship rather than a personal decision. American theologian Stanley Hauerwas names the shift as the foundation for the expression of Christianity in the United States today that is closely associated with patriotism and civil religion. ^ Peter Leithart, Defending Constantine: The Twilight of an Empire and the Dawn of Christendom, p 287. Peter Brown, The Rise of Western Christendom (Oxford: Blackwell Publishing, 2003),60. Basil's Struggle with Arianism after Constantine.